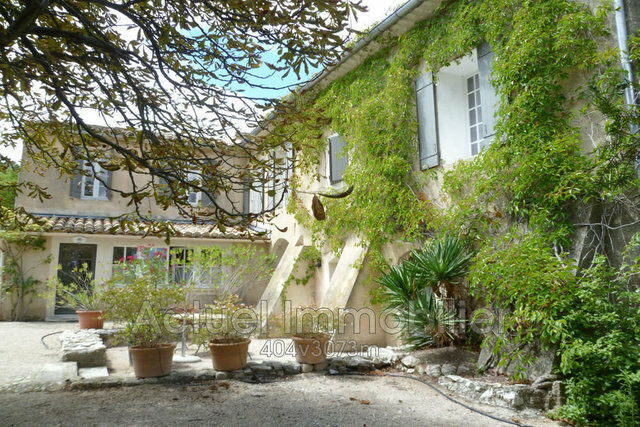 Near the village of Eygalieres, beautiful estate in the heart of the Natural Park of the Alpilles. The Mas is currently used as guest rooms property, built on a park of about 7.5 hectares with an olive grove of 600 trees and pine forest on approximately 3.5 h. Le Mas whose origin lies in the XVIII century, has been completely restored and today it consists of a private apartment of 100 sqm, and 8 apartments for rent (F2 to F3) each with a terrace. Thus, this property offers three main buildings for about 580 m² of living space plus outbuildings (barn, shed). Nice swimming pool 14 x 6 m with pool house. Beautiful nearby leisure park Mas offering many recreational areas and a clear view of the Alpilles. Great potential with various projects.